Utilize the Cluster Ordinance (Land Use Ordinance 149.49) to develop a 21 lot subdivision on a 15 acre parcel of land to include 1 existing and 16 new single family residential lots and open space. Provided research, permitting and associated design services to advance this project through municipal & state agency approvals. 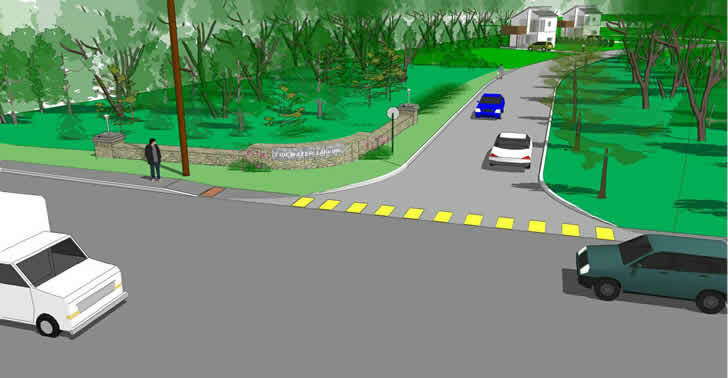 The site's 1,400 lf roadway and cul-de-sac will have a 50' ROW with a main entrance on Route One. With over 630 ft of direct access to the tidal zone, the property offers exceptional opportunities for direct water access at high tide. All lots will be served by public water and sewer. Proposed stormwater treatment options include a vegetated buffer and level lip spreader, with pocket rain gardens and drip strips on individual lots where needed.